Bullet-proof Range Rovers built for fashion and function? Sounds like another Kahn production. 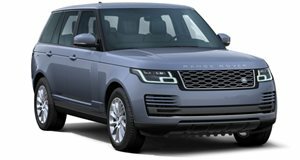 British firm A. Kahn Design (formerly known as Project Kahn) has tuned yet another Ranger Rover this time for protection purposes. The metallic gray Military Edition features a luxury interior along with protective features designed to keep heads of states and important persons safe from those seeking to harm said figureheads. Starting with the security features, the Military Edition features blacked-out windows for anonymity (and style, according to Kahn). The windows are lightweight and bullet-proof. Tough 22-inch Kahn wheels wrapped in thick tires will help the SUV continue moving in times of conflict. In terms of style, the exterior features LED lighting in the front, a solid body kit with an RS grille finished in carbon fiber with military gray inserts and orange brake calipers. Kahn badging on the exterior help distinguish your customized vehicle. The interior features RS leather with black and gray panels, a blue time clock with a black Swarovski crystal bezel, Kahn billet steering wheel and a quilted glove box. Pricing for A. Kahn Design&apos;s Range Rover Military Edition is set at £73,875.